“Hey, are you going to make that thing again?” my Mum asked me yesterday. Call it Tarte Tatin Noveau. I try to remember where I got the idea to put this Tarte Tatin and pancakes together. but I’m not sure anymore. I was doing a Google search for tarte tatin pancakes, but none of the results was what I was looking for. So here it is. Paying true homage to that old phrase, “eat dessert first”, this is readily versatile: for, depending on how it’s dressed up, it can be eaten as breakfast or dessert. It’s delicious eaten on its own, but if you’re feeling indulgent, I imagine that a slice of this tarte tatin pancake, served while still warm, with a scoop of coconut milk vanilla ice cream and maybe with some hot fudge sauce or caramel would be the ticket. I’m reformatting all my recipes – this is the first recipe to be written with the new template. Let me know what you think! Is it easier or harder to follow, easier on the eyes, etc.? Before I go, let me mention that my good friend, Amy of Simply Sugar and Gluten-Free, is in a blogging contest. She is one of eight bloggers – and the only gluten-free one! – in FoodSpring’s “My Most Exciting Food Experience” competition. The blogger with the highest number of points at the end of the day on June 6th will be the official FoodSpring.com Blogger at The Fancy Food Show this July in New York City. If she wins, she will be representing the gluten-free blogging community! I’ve already voted for her, and I’d love it if you do the same. To do so, simply create an account at FoodSpring.com if you’re not already a member (only FoodSpring.com members can vote). Once you’ve done that, rate Amy’s post – give it a high 5! I’ve linked this recipe to Slightly Indulgent Tuesdays. Other pancake batters, with “flour”, could work, too; they may not “puff” but it’s not that important since it’s going to be flipped upside down anyway. 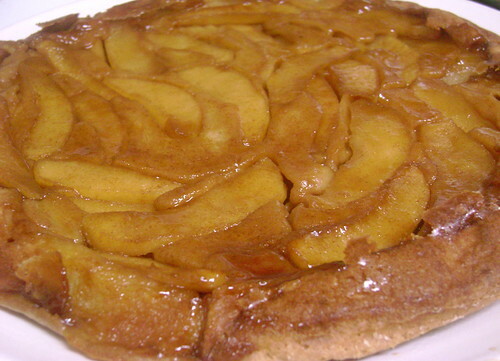 The batter to make flognarde would work, as well – and it would also make this tarte tatin pancake SCD, too, since the flognarde batter uses almond flour! I also made this without xanthum gum and I liked it better, in terms of mouthfeel; there is no difference in flavour. Update: A few times I’ve forgotten the honey in the batter, with little difference in flavour. In those cases, I’ve just drizzled some honey over top after I’ve flipped the pancake over, or not at all. 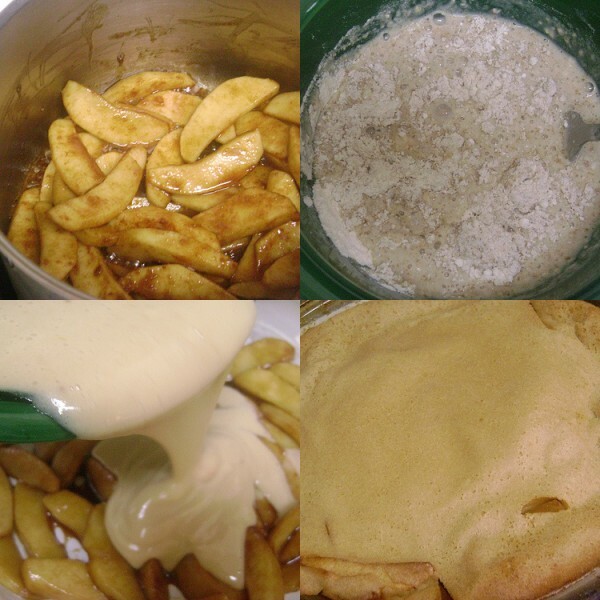 Also, almond extract is wonderful in this: after sauteing the apple slices, mix in 1 teaspoon of almond extract and also add 1 teaspoon of almond extract to the batter (total 2 teaspoons). *The company Eden Organics carries a blended rice and soy milk. **Olive oil may also be used. Preheat oven to 400ºF. Grease a 9-inch pie plate (mine is glass) with coconut oil and lightly flour (I used white rice flour, although any gluten-free flour will do), using a sieve or a finely-holed tea strainer. You may cover the bottom of the pie plate with a circle of parchment paper to make it easier to remove the pancake but this is optional; you shouldn’t have a problem if the pan is well greased. Do NOT use wax paper, it doesn’t work as well. Peel and core the apples, cutting each apple into 12 wedges and then cutting those wedges into 3 slices, lengthwise. Toss with coconut sugar, cinnamon, and lemon juice. Saute the apple slices in coconut oil over medium heat, stirring occasionally, for about 10 minutes, until caramelized. Remove from heat and let cool for 5 minutes. 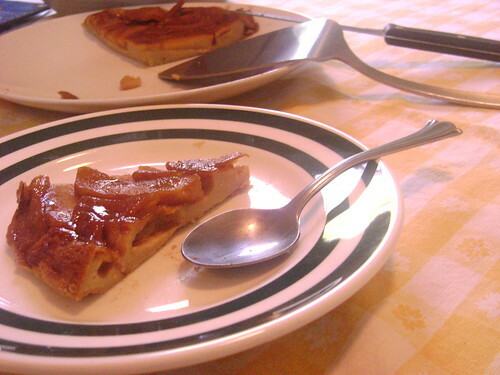 Dump the sauteed apple slices in the prepared pie plate; they don’t need to be arranged in any particular way. Mix the flours, xanthum gum (if using), salt, coconut sugar, coconut oil, coconut milk (or other non-dairy milk), and eggs together, making sure to stir out any lumps. Pour pancake batter over apple slices, being sure to cover entirely and bake for 30 minutes. During the last 15 minutes, the pancake will start puffing up. Shortly after it’s removed from the oven it will “fall”. Use a butter knife to help loosen the sides from the pie plate. Cover it with the serving plate, bottom side up, and quickly flip over. If the pie plate is still hot, use oven mitts to avoid burning yourself. Serve and enjoy! This is something I’m afraid I’d indulge in a little too much! Looks delightful, perfect with a cup of hot tea or coffee. Yum, Zoe! You’re like me – dessert any time of day is fabulous. And, thanks so much for mentioning the contest to your readers! I am so thrilled to have your support. Thanks, Amy! And you’re welcome anytime, I’m with you all the way! 🙂 I hope you win! I love what you did with the recipe! What a fun incarnation :). You’re making me want to whip up another one, stat! If you do, let us know how it worked out! It is scrumptious. It’s a favourite here. If you don’t have superfine sweet rice flour, white rice flour will also work – just whizz it in a food processor if it isn’t already finely milled. Hi all thought i would post an update, i made it, however i had some issues millet flour, i used spelt as an alternative. Was really good and my wife loved it, however i do need to practice a bit as it took me ages to peel the apples! Hopefully the link works, is there a way to embed pictures in our posts? I have heard that millet flour can be hard to find in the UK, unfortunately, but I’m glad that the spelt worked in its place and that it was a success! The link to your photos does work. If you have Flickr, you could also consider sending them to the Z’s Cup of Tea Flickr pool. To embed pictures in your comment, use the URLs of your uploaded photos from the link that you provided and insert this code, i.e.